how can we select multiple separate previews and combine them so we can use it as a single preview on color calibration or something like that. for example, is there a ways to select preview 1,2 and 3 combined as the white reference or am i doing it wrong? 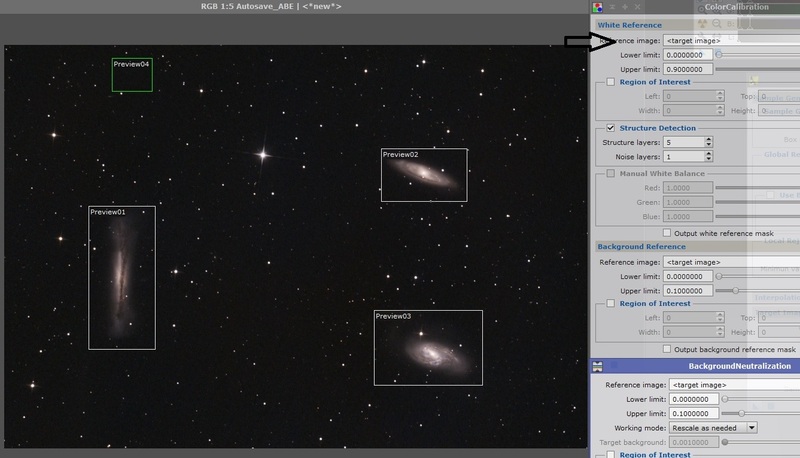 as far as i know you have to select only the object(s) like nebula/galaxy for color calibration. For color calibration not using the photometric color calibration tool, you would capture 2 previews. The first preview should contain as white a source as possible. It only has to be 10's of pixels across... Not very big. you use Preview one where your arrow is, and preview 2 at the bottom for background neutralization. Hit the apply button, and you're done! I am also learning Pixinsight. Have you joined the Pixinsight forum - its on the Pixinsight websight. Its free to join and after registering, you have access to help from Pixinsight experts! Have you tried the PreviewAggregator script under Script->Utilities? There are many fine PI tutorials available. HarrysAstroShed.com is a great resource (free). The link below takes you to this site and you can scroll down and click on COLOUR CALIBRATION to see how to combine previews while doing the color calibration. This is good advice, the way I learned was to make a very small preview of the 'whitest' area I could find, and the other of the darkest area. The previews are quite small trying only to include a 'smooth' sampling of the light and dark areas. Actually, for background measurement it ignores the stars, so it's okay to pick background with stars in them. PixInsight - should I look into it?